The other night, we had a joyous soul family party celebrating Sue and the launch of her fabulous new book, The Energy Codes. Sue has been working on this book for a long, long time and it was time to celebrate her. You’ve probably heard the saying “It takes a village to raise a child.” Well it takes a village—a soul tribe–to create and launch a book, too! It’s been amazing to watch all the people who’ve come together to help support Sue in her journey. 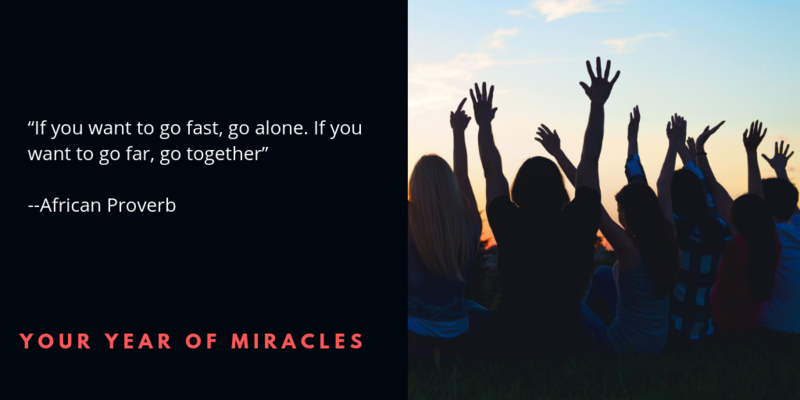 I (Marci) have also seen how the most amazing developments in my life have come because of the support of my soul family, including the birth of Your Year of Miracles (with deep gratitude to Debra Poneman and Kim Forcina). We invite you to dig deeply into finding who your soul family is. Make a list of who’s part of your soul family and how you’d like support from them. Maybe pick up the phone or send an email asking for support. AND be open to receiving. That jittering is a part of you tapping in and coming to life in a new way. And, when you do tap it and allow it to be breathing along with the rest of you, then your soul family reveals itself (they may be different than the ones you thought were there for you). A greater resonance steps up into your life. And the next thing you know, you experience this divine sensation of support that helps everything unfold with greater grace. May you find the people you want to go together with, and may you have a beautiful time on the journey. We are so thankful to be on this journey with you! Please share with us what soul family means to you in the comments below. Congratulations Dr. Sue! I will definitely purchase your new book. Thank you Marci and Sue for being mentors extraordinaire—like twin, twinkling, diamond stars in our night sky—with a rare pink moon. Soul Family means the inner most part of my being shared and released among like minded people who have a deep yearning to move beyond those feelings which says, there is more to what I’m feeling. Find the dots that connect to center of one’s inner most being! you are just wonderful, what a blessing to belong to a family like this one,many,many thanks. Thank you, Marci and Dr. Sue for sharing this with us. I’ve just began the search for my soul family. I trust the journey will bring me closer to opening up myself to receive. Something I need to work on. I were told as a child growing up, that it is better to give than receive, so I spend my life giving, not know how to receive. Thank you Marci and Sue! Wow! What a wonderful post! I love how my soul family has grown since I started with YOM. The love keeps expanding! Sending you love and light! And I am loving my Soul Sisters! Thank you so much! I had not contemplated going out and looking for my soul family – but I am going to open myself for this. Thank you again! Yes! Being open and receptive is a great first step. Thank you so much for your inspiration. I have been receiving the gift of my soul family for many years. First to come are my Soul Sisters, and most recently now that the goal of our organization Living Labyrinths for Peace is clear, people have been connecting with me to help everywhere. The visionary goal is to build a Multi-Media Labyrinth Peace Museum in Sedona, Arizona. People may choose what labyrinth design to walk, project it on the floor, surround images of where they want to walk and overhead images in an astronomical dome for such occasions as birthdays, marriages funerals, especially peace or conflict resolution workshops. Thank you for you help. What a beautiful idea, Sandra. May your vision be brought into presence. I’m sure it will have long range benefits beyond the scope of those who chose to walk it’s path. It’s one of our favorite places! Thank you for this uplifting message. Being in this program has opened me up to all of you as a soul family as well as attracting and seeing who resonates as soul friends an family in a whole new perspective. Lovely! We all need support in our lives. Glad we are here for you. Wonderful reminder to check in with my soul sisters and to see what kind of support they need too. Thanks Marci and Dr. Sue. for this message. My soul family continues to evolve, depending on my ability to up the receiving end, as well as the giving end. Your words help us put our attention on this and support each other. And I am loving Dr. Sue’s book, a deep acceleration one page at a time! You’re so welcome! Glad you’re enjoying the ride. I have been building my soul family for awhile and love how it is growing! Thank you for this adventure! So pleased to be on this journey with you! When heart is pure and mind is clear then God is near. When ego is zero one becomes real hero. I have absolutely no idea who my soul family is. Start by being open to the possibility and then seeing who’s already in your life that might be a someone you can add. Or setting the intention to attract exactly the right people into your life can help. Thank you for this message. I often find it difficult to both ask and receive. Oh my. Soul family… rich with grace… thank u all for u r energy of ♥️ and🌈 rainbow of bright colorful light. The brilliance is magnificent. Secondly, I laughed at the synchronicity of your message. I’ve created a new website, which I know in my gut is the path I should be taking. I stepped out of my comfort zone today to ask my YOM Group Members if they’d be open to sharing my positivity quote cards which also contain the name of my website; not only to help drive people to my site, but also make someone’s day, lift someone’s spirits or remind them they are not alone. The replies of my new sisters has touched my heart so deeply and profoundly. I’m in awe and feeling totally loved, supported and uplifted. Thank you to my new Soul Family!!! I love you from the bottom of my heart ❤️ !!! How beautiful, Paula! That’s why we love our Miracles Groups! I sure enjoy the joyful radiant beauty of you two!…..but WHERE ARE the brothers, the MEN in the group? ARE THERE any? and why so few if the showing among commenters here is representative? I suspect it DOES take other men to show men the way out of their adverse socialization in order to grow and evolve, for the most part, however owning our ANIMA or inner feminine nature can be learned from women….and that’s what the men’s group work is largely about. Just as the woman’s movement beginning in the 70s was about Women owning their ANIMUS or inner masculine traits (frm Jungian psychology), their linear verbal skills to back up their FEELINGs , their ACTIONs of protest etc. My own soul family is very large I’ve decided, since I”m part of so many groups like this one, yet not committed to any save for our LOCAL (in person) 5-D Transition Support group. This addresses our ASCENSION directly, both the astro physics AND body-mind psychology forces at work effecting US. THAT’s what I think. Thanks for what ur doing. I’m very glad ur doing it, since it’s helped so many women who otherwise would have little to no support. So you videoed this in front of a mirror? Good catch. I wondered about seeing words spelled backwards in other videos. I replied to your comment, John. But, I don’t see it come up in the comments? Of course, now it showed up after I wrote that it didn’t!! Must be a delayed timing function. You know, John, there must be some weird setting going on with our computer as it’s always recording videos in mirror image like that. Tech is not our strength! I have started to read your book, Dr. Sue and I am loving it and it is speaking to me like very few books do. I am feeling it on an energy level. I think u r feeling this power surge of love and oneness because we are all connecting to the Truth and you have explained it in a scientific way that makes sense. Since I started reading it, I have been keeping my attention on my energy, and when I get caught up in the story, I am conciously bringing my attention back to the present moment energy. Eckhart Tolle introduced me to the present moment, but now I see it as energy. Thank u, Dr. Sue and Marci! You both have been fabulous. Having a soul family who truly cares about changing this world and making it a more conscious world makes my heart full! Fabulous to hear that you’ve got this awareness around your energy now, Barbara. So powerful. What a great revelation. Thank you! Since starting YOM the beginning of this year, my life is unrecognizable as the Miracles are a daily occurrence as I find numerous ones at least hourly and I feel like I’m floating and wake up “Happy for no reason” every morning except that I am alive and totally LOVING my life!!! Thank you SO much and the idea of calling us a soul family is wonderful and feels so right!! I have been getting ready for this my whole life and I SO appreciate that I get to live out the rest of it with all of you!! Best wishes for your success for your book. Look forward to reading it and enjoy the elevation of your spirit with the launch of your new book. I can relate to your feelings of excitement and accomplishment! A year ago, I leaped off a plane from Colorado where I had been skiing moguls and steeps of powder with one of my soul sisters and her husband, a guest in their beautiful Rocky Mountain view home. I felt strong, joyous, filled with gratitude and proud of the healthy life I had chosen that enabled me to ski and distance train as a woman far younger than my years- and to parent four amazing women pretty much solo. Life felt full and my future so bright. On April 8, all of that changed. A nonsmoker, nondrinker, Psychologist practicing mind-body medicine with clients and a meditator even before Deepak Chopra made it mainstream, I went to the Doc thinking I had a back injury from too many Colorado moguls! Instead, the Attending Resident MD pronounced a diagnosis of lung cancer- progressed. My gripping back pain was its spread- a mass…. Week one found me surrounded by a tribe of women- my daughters, friends from whom I had not heard regularly, their daughters- my soul family was born. Initially, I feared the novelty would wear off, that people would migrate off to their active lives while I went to Amd from treatments and felt leveled on my couch, leveled physically from fatigue of the fight and mentally from the shock and courage required to face pain and losses I’d never imagined- running, treks to NYC and DC to see my kids. I learned gratitude and to let people help me- even my daughters and their fiancées and significant others. With the help of my Soul Family and daughters, I walked two daughters down the aisle- yes, THE aisle, to see them marry. In weeks, I will meet my first grandchild- a girl! Like many here, I had always been the nurturer- mother, wife devoted for years to the wrong man, Psychologist in clinical, sports, and corporate settings. It was about giving life blood. Learning to accept Amd trust in my Soul Sisters and Soul Manfriend has brought me to a new level of peace I could never have imagined. Their love and modern medicine have enabled me to see another almost year- and to feel new aspects of love and gratitude and a spiritual depth I had never imagined. I feel joy, gratitude, love and loved. What a powerful story! Goosebumps reading it. So beautiful!!! Beautiful message. Dr. Sue is new to me and I am reading The Energy Codes and super excited about it. Wonderful! Thanks so much, Diane! Thank you! This was powerful for me! fully appreciate, big thank to both of you! This program is so much more than I thought it would be. It is also a lot of “work” to keep up with. Recognizing and writing down wins, miracles and intentions, meeting with and supporting small group members – I love it. I am a natural giver and knew I was lopsided in being able to receive. My theme of “opening myself” is astounding me as I see I am more open about being my magnificent self. I am enjoying observing and letting go of so many of my holdbacks, one of which, I recognize just because of this miracle moment thread. Which is that receiving will help me open up even more. How gracious that is. The small miracles group is also really helping with that. I use the oh’oponopono on myself and as well as others. It is changing my life. Sue’s book is energizing me and I am only on chapter 3. I look forward to opening myself exponentially this year. My own out of body experience when I was in my 20’s allowed me to recognize myself as my soul – I didn’t take it further than that as I still had fear (although, no longer fear of death) now is my time to let go of all fear …..and so it is. To me, soul family is made of individuals with whom you share love, acceptance and support without judgement. Is it odd that my soul family consists of my three best friends and my miracle group? We have moved often and have lived in the “boonies” for years and I don’t know very many like minded people. Although come to think of it, I could reach out to a few global friends that I know on facebook with whom I share energy healing. Thank you Dr. Sue, Lisa and Marci. You are stars in the brightest constellation in my sky. Christina, that’s not odd at all! Sometimes your soul family will be people you feel you have known all your life whether you’ve known them for decades or days. So happy you have found yours!